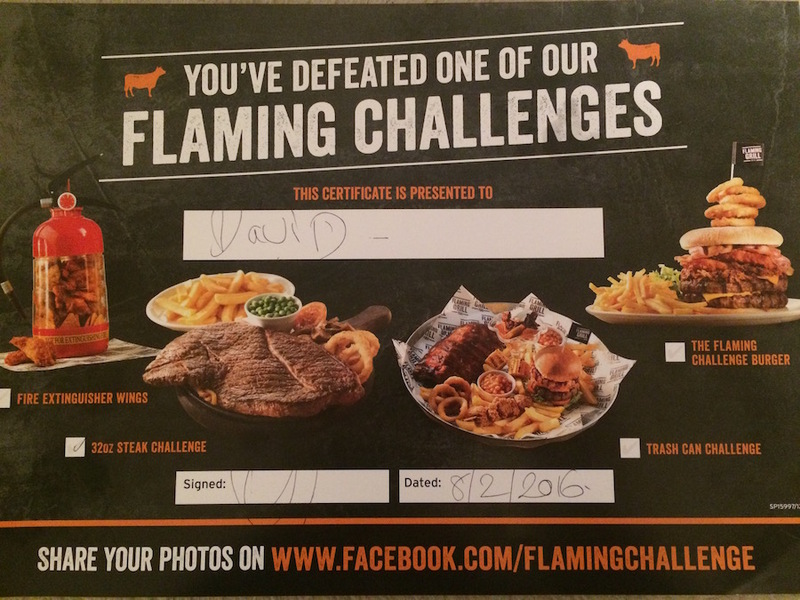 Completing a food challenge has been one of the things I have wanted to do for a while now. 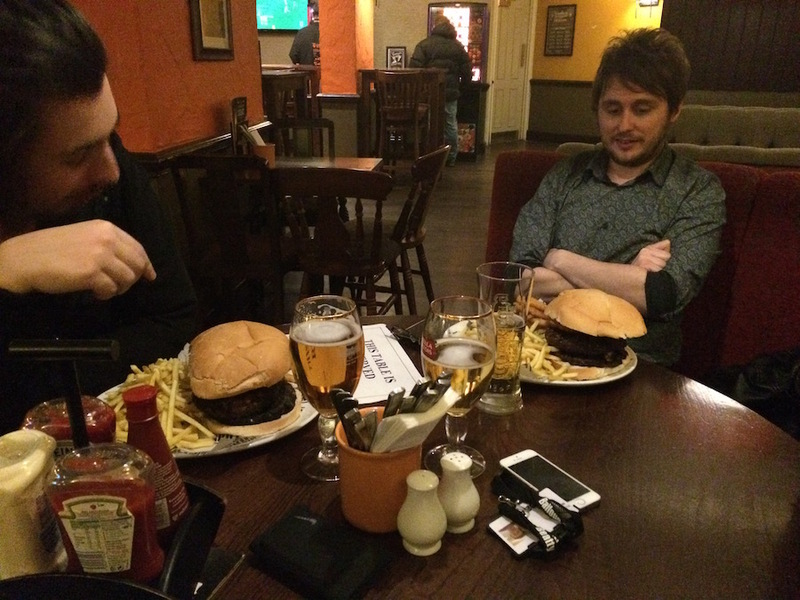 I didn’t want anything too huge but as with all food challenges there are of a certain size or that wouldn’t be challenges! A few of us from work decided we would head to a Flaming Grill as they have some cheap challenges. There were four of us in total. I had the 32oz steak and chips and the other boys had a the 24oz burger with chicken, bacon, and chips. When the plate arrived I lost all confidence in my ability to get through this thing alive. 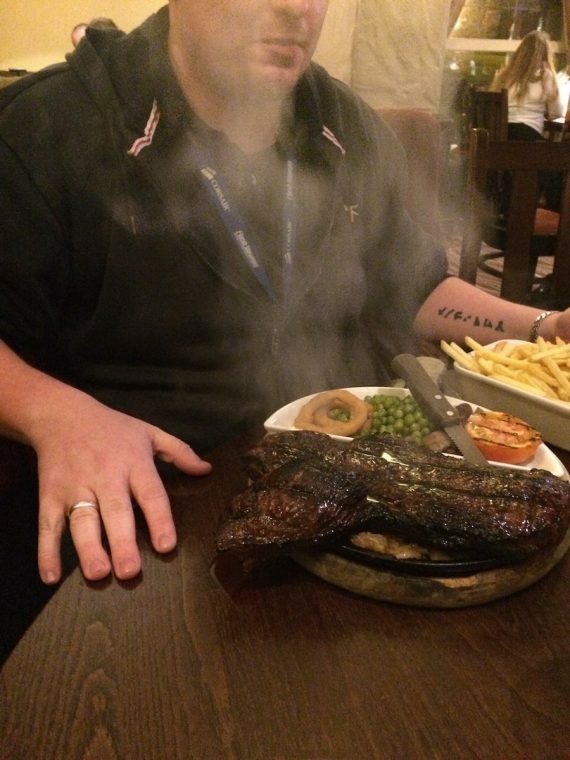 The steak was bigger than the damn plate! The boys faces when they got theirs was pretty much the same as mine! The size of their burger! Christ! As there was no time limit on the challenge we decided that we would take our time. We didn’t haven’t to be anywhere afterwards. I cut mine up into nice small pieces and worked my way through the steak. After about an hour I had finished the steak and half of the chips. I was reaching my limit. Thirty minutes of chatter and I decided to pick at the remainder. I finished the chips – this left me with the onions, onion rings, tomato, mushrooms, and peas. The onion rings were easy. Down they went. Next came the onions and damn they tasted disgusting. They had been sat under the steak the entire time cooking away on the hot plate that it was served on. They were burnt, gooey and tasted like ash and were mixed in with some of the mushrooms. I left those for a while and started on the peas, tomato, and other mushrooms. I hate mushrooms – I don’t think they even lasted more than a second in my mouth. They were swallowed so quick. The same happened with the tomato. The peas were quite nice though. Everything is gone now except the onions and a few mushrooms. At this point I look up at the boys and they had got through about half of their meal. Hardly touching their chips and other sides. It looks like I had to do this one on my own. Each and every bite of the onions and mushrooms made me want to be sick. I was so full my stomach was hurting, and they tasted so gross. Finally after 2 hours and 30 odd minutes of the plates arriving I had finished. I had completed my challenge! I had been victorious. I was a champion! I even got my certificate to prove it!